We are ready to take your order or answer any question, 6 am - 4 pm, PST. Monday - Friday. We will take your order over the phone. You can email us your photo/logo (see "How to submit photo/logos" below). For most orders, you will receive a layout proof of your card personalization within 48 hours. Most orders are shipped in 3-5 business days from our receipt of your layout approval. UPS Ground shipping takes between 1-5 business days. Shop our online catalog anytime, day or night. We are available during our regular office hours to help you navigate through the site, give you individual attention and assist you with any questions you might have. You can configure the information for the backside card layout and see firsthand mock up of your custom creation. You will receive an email confirming receipt of your order. We will email you a layout proof within 1-2 business days after receiving all your materials such as photo, logos, etc. Fax your order form 24 hours a day. - Click here to print a copy of the order form. You will receive a personal phone call confirming receipt of your order. We will email you a layout proof within 1-2 business days after receiving all your materials such as photo, logos, etc. You will receive a phone call confirming receipt of your order. We will email you a layout proof within 1-2 business days of receiving all your materials such as photo, logos, etc. Send us your photo/logo by e-mail. Submit your file in either Mac or Windows format. E-mailed photos must be at least 300 dpi, in .jpg or .tif format and 2" x 2" or larger. Images for custom cards must be at least 1/4" larger then finish size. Photo/logo file size between 300 KB to 1 MB+ should be acceptable for print. Scanning in previously printed material will likely produce a "moire" pattern, which is a visible, distracting texture. Whenever possible, scan original photographs or artwork, not previously printed material. Order as few as 300 cards. 100 each of three styles or 300 of one style. Your order will ship in approximately 3-5 business days from our receipt of your layout approval. Any delays in approval will result in delays in printing and shipping. Alaska, Hawaii, and Express shipping, call for quote. We do not charge until you approve your proof(s). All orders must be paid in full by check or credit card once you approve your proof for print production. We provide 2 free proofs. An additional charge will apply for excessive layout changes beyond our standard free proofs. All layout approvals must be received before printing begins. Returned checks are subject to a $25.00 fee. Prices in this catalog are subject to change without notice. Absolutely No Cancellations after proof approval. 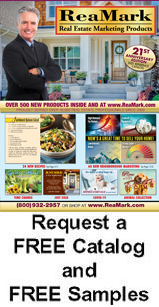 All images and copy contained in ReaMark products are the sole property of ReaMark and cannot be copied or reproduced without express written approval by a ReaMark officer.